A citizens group fighting a rezone of the University District believes the city is required by law to analyze low-income-housing needs before upzoning the neighborhood. A citizens group that opposes a proposed upzone of Seattle’s University District has filed an appeal of the rezone, saying the city first needs to measure the effects on affordable housing. The Seattle Displacement Coalition filed the appeal last week with the state Growth Management Hearings Board, which makes rulings on the implementation of the state’s Growth Management Act. The group wants to block the upzone until a housing analysis is done and the city takes steps to be sure there is no loss of low-cost housing in the area. John Fox, coordinator of the Seattle Displacement Coalition, said he believes the State Environmental Policy Act requires the city to conduct a “displacement risk analysis” before it changes its comprehensive plan. That plan paves the way for the University District to be upzoned. Under Mayor Ed Murray’s housing plan, “literally every area of the city is slated for some kind of upzoning over the next 18 months and literally thousands of existing low-income housing units across our city would be placed at risk,” Fox said in a statement. A spokeswoman for Seattle’s Department of Planning and Development said the city could not comment on the appeal. 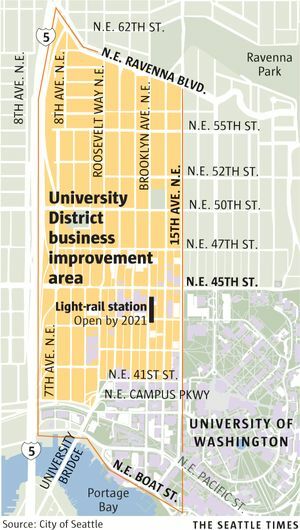 The city has long talked of allowing more density in the University District, especially because a light-rail stop will open at University Way and Brooklyn Avenue Northeast by 2021. More recently, the University of Washington has promoted the idea of turning the neighborhood into an “innovation district,” a place where tech startups could establish their first offices, tapping the brainpower and creative energy a university campus offers. Fox said the Legislature made a change in the growth-management rules in 2010, adding new language that required a risk analysis if a rezone would cause the loss of small businesses and affordable housing. The proposed U District upzone would allow for buildings up to 340 feet tall in parts of the neighborhood — slightly taller than the UW’s 22-story office tower in the heart of the district. The tower, built in 1975, was known for many years as the headquarters of insurer Safeco. Fox believes the city first needs to deal with issues already facing the University District before considering an upzone — issues such as the loss of low-income and affordable housing, a lack of transportation options and open space, and a growing homeless population. The Displacement Coalition has canvassed the area and counted nearly 1,500 affordable rental units and houses that would be in the rezone. Much of that housing could be lost if the upzone is approved and the neighborhood is redeveloped, Fox said. He said the coalition has tried to get the city to do such a study, but the city’s Department of Planning and Development refused to meet with them. The coalition is asking that the plans for the University District upzone be placed on hold until the analysis is completed and a policy is adopted citywide to assure no net loss of affordable housing. “We think we’ve got a really strong case,” Fox said.